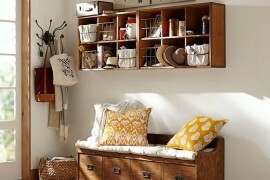 Your cabinets are stuffed, your dresser space is depleted and your closets are nearly bursting at the seams. 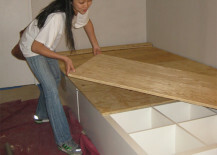 What’s a storage-starved homeowner to do? The solution may lie right where you do — in your bed. 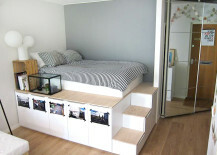 Storage beds can add a healthy amount of stuff-stashing space to your home, but they can also be quite pricey. 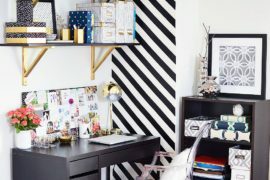 If you want to reap the benefits of these double duty furniture pieces without spending an arm and a leg, read on to see eight DIY ways to make them yourself. 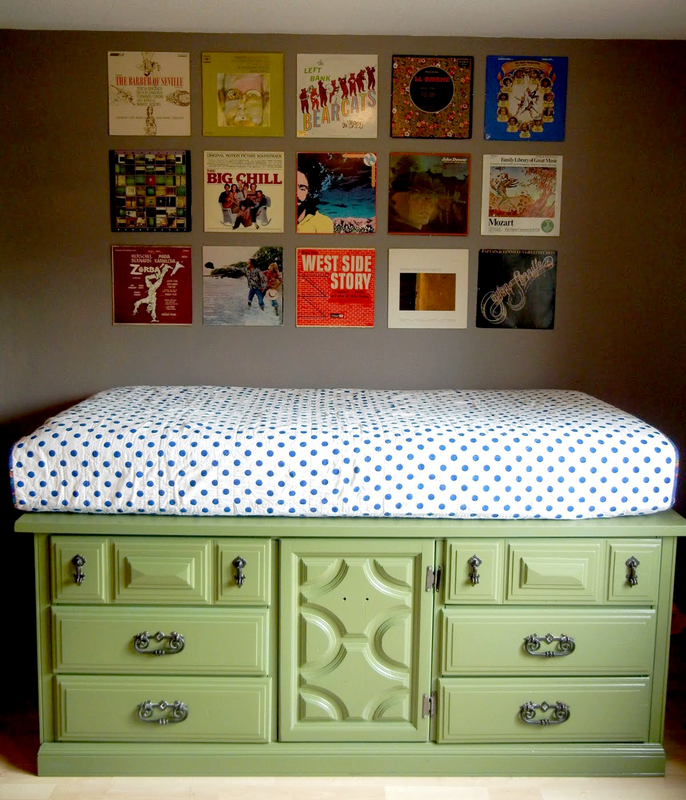 Nora of Oh Yes‘s DIY storage bed is so impressive that it’s nearly impossible to believe she made it herself. 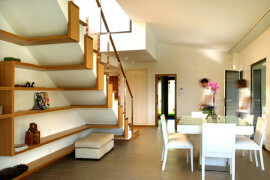 The elevated platform and stairs separate the sleeping area from the rest of the room, making it feel like its own separate space. 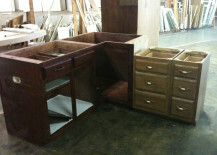 And check out the drawers on the side of the steps – talk about convenient access to your stuff! 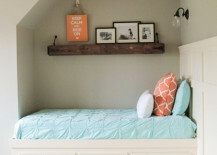 Awkward nooks can be a source of frustration, but with a little bit of pre-planning, they can be turned into the perfect, custom-looking place for a bed. 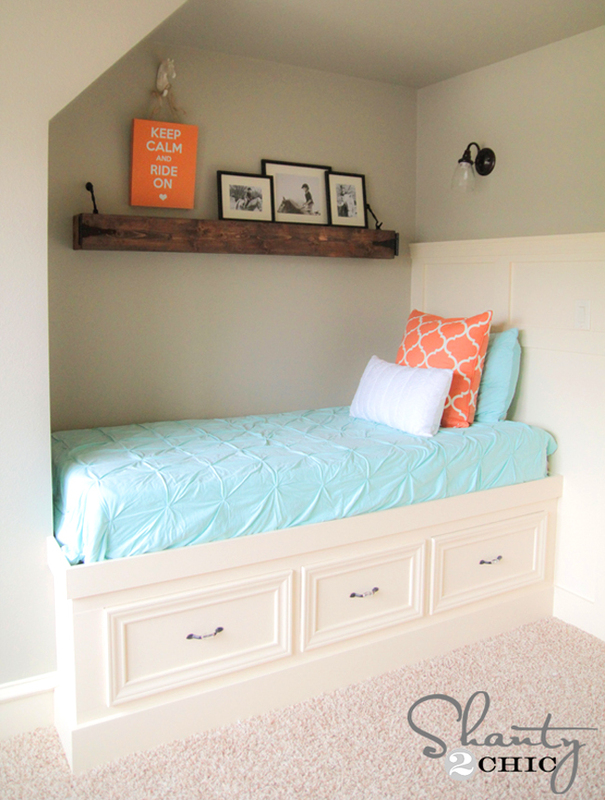 Shanty 2 Chic created just that with this built-in twin storage bed for her daughter. 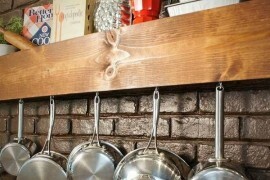 Check out the free plans here to copy this project in your own home. 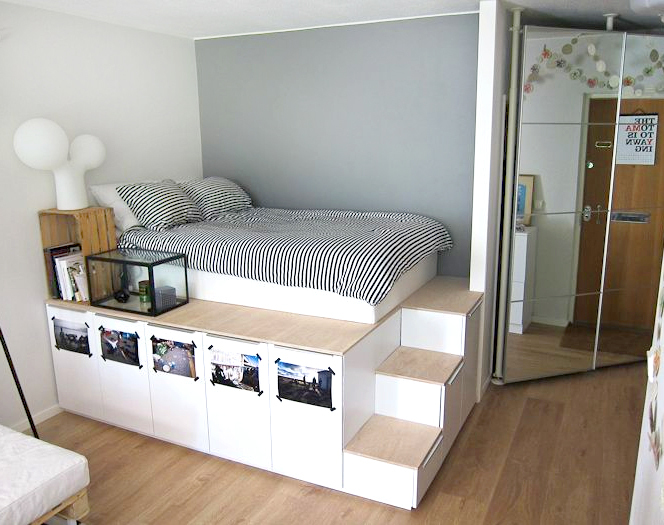 This clever project takes advantage of the fact that many standard-sized dressers just happen to be the same length as a twin mattress. 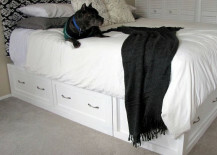 Lady Bird and Fellow repainted an old wooden chest of drawers a retro shade of avocado and used wood, L brackets and wood screws (purchased for less than $28.00) to construct a little boy’s storage bed that even has its own secret hiding spot underneath! 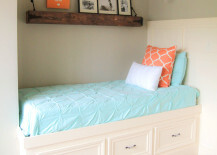 Made of simple and affordable materials that can be purchased at your local hardware store, this wooden DIY storage bed is a project that can be finished in a weekend. Lowe’s even has an easy-to-follow video of the steps for the more DIY-challenged here. 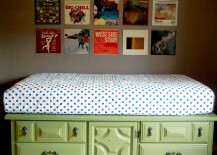 Believe it or not, this bright and cheery corner storage bed unit began as inexpensive, salvaged kitchen cabinets purchased for $60. 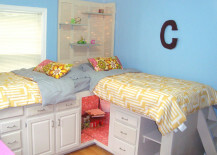 Built for two sisters ages 8 and 9, the twin beds boast plenty of organization for toys and clothes, as well as a crawl nook perfect for a girls-only playspace. 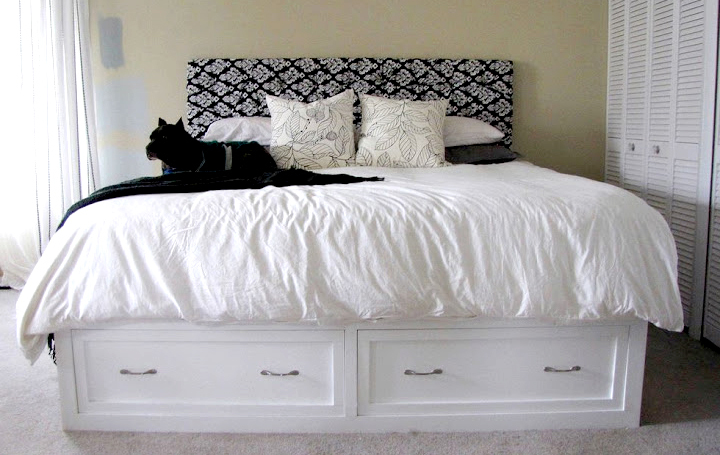 Based on Pottery Barn’s Stratton Bed, this homemade version is nearly indistinguishable from its inspiration. Considering that it was made for $400-$500 (compared to the Stratton’s $1800 pricetag), you’d probably be able to have some pretty sweet dreams thinking about how much money you saved. 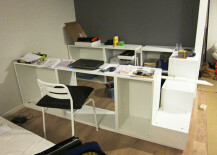 And finally, here’s my own DIY storage bed tutorial using a ubiquitous IKEA EXPEDIT bookcase. It’s easier than some of the other projects seen above, but I recommend storing things you don’t need access to as often since this particular design requires moving the mattress when you want to retrieve your items. 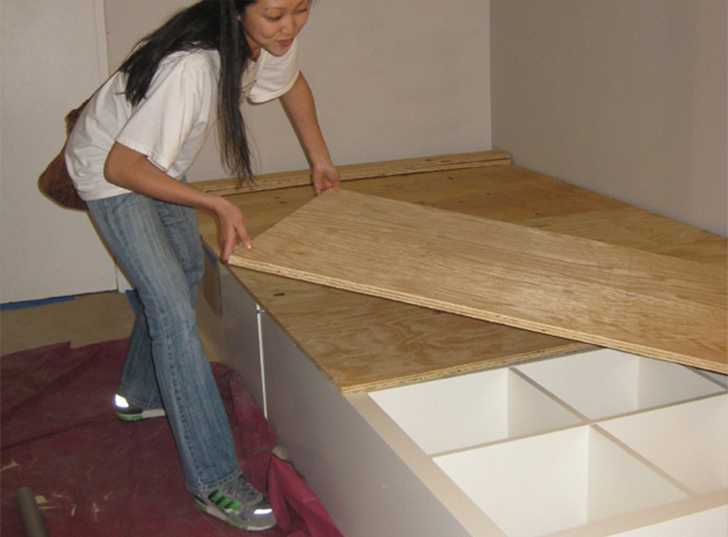 Which DIY storage bed would look best in your home?